You don’t need to work for the UK Met Office to realise winter is on the way. With clocks poised to go back on October 29th, no doubt you’ve already noticed a chilly bite in the wind, and sun ever lower in the northern sky. And with changing conditions come changing risks. Yet every year the darkest season still catches people out. Cold nights may draw in steadily, but with our heads down on the job, it feels more like winter sneaks up on us, pouncing out of nowhere. A first line of defence against winter hazards is the humble toolbox talk. Done well, with the kind of structure and engaging discussion inspired by Huddle Cards, it motivates teams to stay focused on safer behaviour. Done badly, and the gap between exciting vision from above, and inspirational team talk on the ground, is troublingly wide. And this disconnecting gap is often where things start to go wrong for team leaders and supervisors, who struggle to keep a talk lively and focused. If this sounds familiar, don’t worry – it’s a real challenge, even for the leading global organisations we consult for. The fact is, public speaking doesn’t come easy to every team leader or supervisor. They (like most staff) would probably rather get on with the job than stand around talking about it. And let’s be honest, who feels like facing a crowd in an icy wind, to deliver a motivational speech about a job they’ve probably done a hundred times before? So to tackle this perennial problem, here are five fresh ideas to help team leaders and supervisors easily turn your vision into a useful, engaging winter toolbox talk. Make reports on key winter risk areas, behaviours and historical near-misses freely available to your leaders and supervisors. They shouldn’t have to go through different departments and gatekeepers to get at the data they need. Instead, these resources should be obvious, accessible and right at their fingertips, so they can include them in their team talks as a visual aid or talking point. You could even go a step further, with striking graphics and charts, plus open public data like weather forecasts, or general industry statistics on risk at this time of year. A poignant tale of what happens when people take winter safety for granted is a powerful way to bring your vision to life. It also takes the pressure off leaders and supervisors to come up with new material for every toolbox talk, whilst simultaneously empowering storytellers and captivating audiences. Everyone has their story, so ask supervisors to encourage contributions from staff, and free-up storytellers from different parts of the business to participate in team talks. If you struggle for first-hand inspiration, try looking to winter folklore, classic literature, film and mythology. Be creative (although we think ‘Frozen’ might be a stretch on-site!). Make sure your team leaders and supervisors know where to point people if they need more information, resources or support after a team talk is over. Once people get inspired by consistently decent toolbox talks, ideas and improvements soon follow. It also means lessons learned one winter can feed into the next. A supervisor who knows what happens next, who reassures their team that management will act on their suggestions, is a powerful force for change. The coldest season is ripe with themes, imagery and customs – probably more so than any other season in the northern hemisphere. Use this to your advantage. Be creative with an organisation-wide theme each week, for example. We once helped a client with a dramatic campaign using Dickens’ ghosts of Christmas past, present and future to explore accidents and consequences. How about the 12 days of Christmas? Or borrowing yuletide customs that unite your teams with others at sites around the world? There are countless ways to connect all the joys of winter, like gift-giving, festive cheer and snow days, to how precautions at work mean we stay well enough to enjoy them with family. This includes mental health and well-being; which has a strong connection with reduced daylight and isolation. If you don’t already, help supervisors and team leaders devise their own toolbox talks. Don’t just provide a formal, scripted list they have to work through, because it’ll soon sound like one. If you follow point 1. above, informed supervisors and team leaders will relish the opportunity to put a bit of themselves into a spirited team talk. Especially if the figures speak for themselves and there’s a clear, focused theme as in point 4. It’s all about giving thought-provoking guidance, like the kind on a Huddle Card – not instructing them. In every walk of life, people always perform better when they know what to aim for (an engaging winter working team talk in this case), yet feel free and empowered enough to make their own way there. We expect people to prepare practically for winter working – with salt for icy paths and temporary lighting in dull weather. So why don’t we do the same for team talks? With friendly guidance and accessible resources at their fingertips, supervisors can easily lead focused and relevant team talks this winter. You can make this whole process even easier with a ready-made Huddle Card. We’re just launching a winter-themed one now; full of discussion prompts and quick-wins – perfect for capable supervisors who need fresh ideas, and a gentle nudge to inspire their team. Best of all though, the Huddle Card makes learning the focal point; not the presenter – something our clients find reassuring for people who aren’t natural public speakers. However you decide to tackle this perennial safety challenge: be quick. We’re already cruising into autumn, and before you know it, winter will be upon us yet again. Every sound organisation knows its key risks and behaviours for safe working this winter. But how do you transform that noble vision into a lively, engaging toolbox talk on the ground? One your team leaders can easily get to grips with. 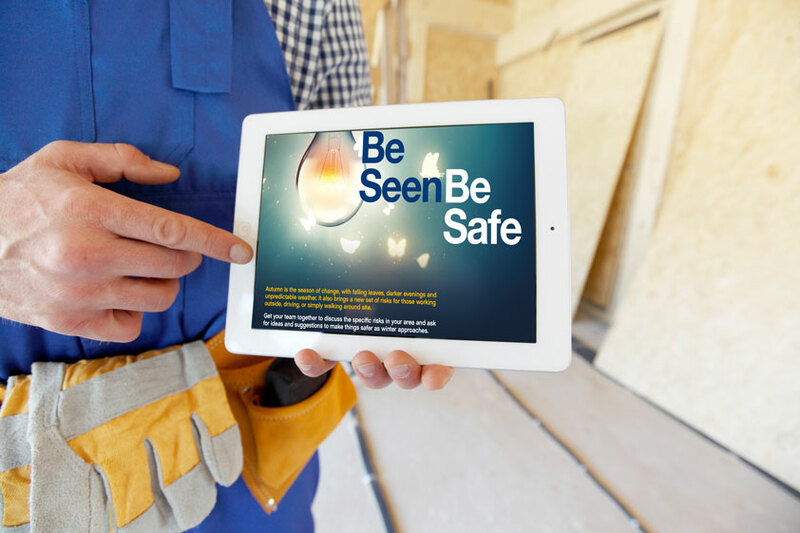 Not only is the Huddle Card proven to inspire better behaviour and renewed enthusiasm for safer working. It makes learning the focal point of the toolbox talk; not the presenter – vital for encouraging busy or nervous supervisors to engage with their audience. The Huddle Card is available in print or electronic (PDF) formats, and easily branded with your company logo.